Who has not been curious about the Rich Dad, Poor Dad book? 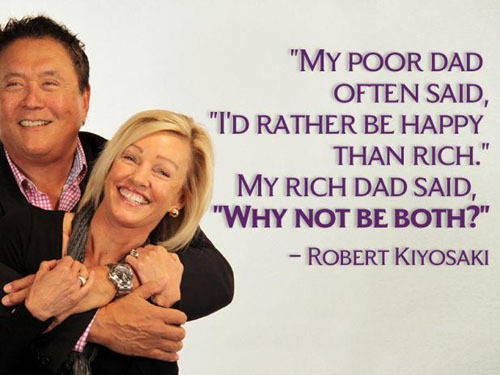 More so, who has not been intrigued by its author Robert Kiyosaki? Published in 2000, it has been widely talked about and criticized. The book does not only describe relationships, but also finance and resource management. This has earned Kiyosaki many speaking engagements, and his book was followed up by other releases and titles such as Why You Want to Be Rich, which is published last 2006 co-authored by Donald Trump as well as Own Your Own Corporation, How to Buy and Sell a Business and Real Estate Loopholes. Robert Kiyosaki is also a motivational speaker, businessman, financial coach and commentator. He has authored over fifteen books, which have a sales count of twenty-six million copies, and his Rich Dad series has become bestsellers listed under the Wall Street Journal, New York Times and USA Today. Also taking into consideration the younger generation, Rich Kid, Smart Kid was released in 2001 to help parents educate children about finance and management. Robert Kiyosaki has been known as a financial literacy speaker, he is also a leading proponent of new entrepreneurship concepts, business education and investment methods. He is pushing for financial literacy concepts to be taught to children of all ages. He also maintains his own blog, and he regularly contributes to Yahoo Finance about business, global economics, financial markets and personal finance and management. It may seem that Kiyosaki is teaching people to make more money, and he is willing to share his strategies to his readers, as seen in his book Rich Dad, Poor Dad revealing what the rich are teaching their kids about money that the middle class and the poor do not. He is a strong advocate of maximizing in passive income and acquiring assets that lead to monetary growth. Robert Kiyosaki attended the US Merchant Marine Academy after completing high school. In 1969, he became a deck officer. He served as a helicopter gunship pilot while serving under the Marine Corps in 1972 during the Vietnam War. He was awarded the Air Medal. This is where he says that his leadership style is patterned. His habits and attitude, he says, is due to the many character development that is taught in the Marines. He says that in the Marine Corps, the discipline, training and toughness carry on. Robert T Kiyosaki is also a son of two former Peace Corps workers. He was first ineligible to serve in the Marine Corps because of his employment with a non-defense, vital industry, but chose to enroll in the US Merchant Marine Academy, and he volunteered for the Marine Corps later on. He briefly served as a midshipman in 1966. Kiyosaki still applies what he has learned in the Marine Corps, where he says 95% of success comes from values such as integrity, honesty and courage, which forms character development. He says that he values the training most of all, and he says he is constantly working to improve himself even long after he has left the service. A good deal of his leadership style also stems from his experiences with senior staff officers and flag generals he has met while in the service. He has also been a moderator for military style training for entrepreneurs. In this training set, he focuses on the difference between the traditional business school style and the military style, focusing on not just the mental abilities of most leaders, but also on the emotional, physical and spiritual aspects that are the important aspects of good leaders. The lack of holistic development, kiyosaki robert says, is because most entrepreneurs lack the leadership skills to succeed. When it comes to communication methods and skills, Kiyosaki strongly reinforces the need to keep the focus. The strategy helps him acquire assets and helps him direct those who are eager to learn. The skill most people need to learn is communication skills, which means that if a writer cannot write in a method that could make readers understand, the message that is intended to be transmitted only reaches a limited crowd and makes the effort a waste. Knowing a person’s profession and business difference is what sets apart for those who are good communicators. It is also recalled that the top quotes noted from the Rich Dad, Poor Dad book are “Skills make you rich, not theories” and “In business, leadership skills is not an option, it is a must”. An entrepreneur’s leadership skills determine how well the business performs during the first years of its existence. His books and teachings have had a fair share of scrutiny by critics and finance advisors, saying that Kiyosaki gives too much wrong advice; some are bad and dangerous advice. John Reed is an open critic, saying that it is one of the financial advice books offering dumb advice and that it does not provide practical steps to becoming rich, with many factual errors and fictionalized events that supposedly have occurred. Kiyosaki reiterated that the book is intended to be a motivational book, not a technical book. But the book has earned recognition from celebrities like Oprah Winfrey who has endorsed the book in her show and Will Smith, who has admitted that he is teaching financial responsibility to his son through Rich Dad, Poor Dad. Kiyosaki’s company, Rich Global LCC, filed for bankruptcy in Wyoming after the court ruled that his former business partners were entitled to the profits from events that were scheduled for Kiyosaki years before reaching $23,687,957.21. His spokesperson says that the amount ruled by the court to be settled by Kiyosaki exceeds Rich Global’s net worth and that Kiyosaki does not intend to pay the amount from his own pocket. The move to file for bankruptcy has been talked about in the financial world, leading to question Kiyosaki’s credibility. After being affected by the bankruptcy recently, Robert Kiyosaki still carries on, maintaining his site and still offering financial advice for his fans. His current line of workshops and books include audio books, DVDs, games and blog for those who believe in his methods. Download Robert Kiyosaki books here using the search bar on myStore page under books category.